Trekking the Appalachian Trail is no longer the solitary experience it once was. Backpackers looking for a less crowded, long-trail experience should grab Long Trails of the Southeast to discover the many other long-hike opportunities available in the Southeast. Long Trails covers 7 trails in 8 states, for a total of 600 miles of trails. Each trail description is divided into segments, and includes at-a-glance information offering details on length, trail condition, high-points, difficulty, tips, and trailhead directions. Vivid trail reports describe exactly what’s encountered along the way. Finally, a Trail Log provides mile-by-mile descriptions of the entire trail, including road crossings, water sources, shelters, and more. Whether hiking a trail in one outing or knocking it off in sections, hiking enthusiasts must have Long Trails of the Southeast as a part of their library. Birdshooter’s Take: Johnny Molloy’s book has nearly 50 pages dedicated to the Bartram Trail and he provides detailed information on each of the sections of the 110 mile route. Each segment has directions to the trailhead, highs/lows of the hike, campsites, and tips for the hiker. 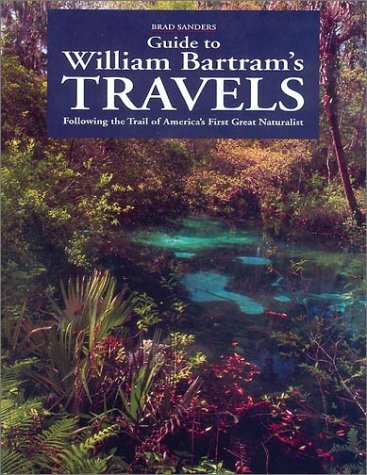 My Recommendation: This is one of two guidebooks on the Bartram Trail and it has some very detailed information on the route. If you do a lot of long distance hiking in the Southeast, this is a good book to get. If you just plan to hike the Bartram Trail, you might do better with the Bartram Trail Guides (listed below). The Bartram Trail is neamed for William Bartram (1739-1823), an American naturalist who explored and documented his exploration in several southern states. Although his route is not entirely known, these guidebooks roughly follow his route and provide specific information tailored for the casual hiker or backpacker. GA Bartram Trail Guide. Covers the GA Bartram Trail (37 mi. ), GA Chattooga River Trail (11 mi. ), GA Three Forks Trail (3 mi.) and SC Chattooga River Trail (20 mi.). These trails are all connected. By doing the SC Chattooga River Trail, part of GA Bartram Trail and GA Chattooga River Trail one has a 40 mile backpacking trip along the Wild and Scenic Chattooga River. NC Bartram Trail. Covers the NC Bartram Trail (60 mi. plus 14 mile road walk across Franklin, NC) from its southern end near Highlands, NC to its termination on Cheoah Bald. The southern trailhead is at the termination point of the GA Bartram Trail on Hale RIdge Road. Birdshooter’s Take: These booklets by John Ray and Malcolm Skove are the most detailed trail guides available for the Bartram Trail. They include trail mileage (in 0.1 mile increments), profile and topographical maps, and detailed directions to many trailheads along the route. My Recommendation: If you are going to hike the Bartram Trail, don’t do it without these books. Visit your nearest outfitter in the Southeastern states or email the authors via this link to get a copy. They run around $5 for each booklet plus shipping and handling (and there’s one for both North Carolina and Georgia). A small discount is available if you purchase both books. Note: These guides are only available in select stores or via direct mail order from the author. Click the link above titled “Bartram Trail Guides” to launch your email browser and send an email to the author. The Hiking Trails of North Georgia is an indispensable resource, whether you’re planning a leisurely afternoon walk or a strenuous backpacking trip. The convenient new format of this updated third edition will enable you to explore North Georgia’s beautiful natural area with intelligence and ease. Birdshooter’s Take: This is another of Tim Homan’s guidebooks and one of the first ones that I used for Georgia hiking trails. It has 124 hikes in the State with 11 maps and precise directions to the trailheads. The book is designed for both hikers and backpackers but focuses only on the trails in North Georgia. It also includes sections of the Appalachian Trail, Benton MacKaye Trial, Duncan Ridge Trail, and Bartram Trail in Georgia. My Recommendation: If you hike a lot in North Georgia, this is the best book out there. 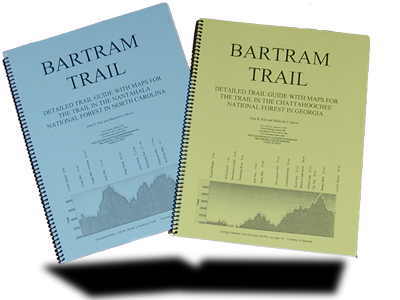 If you just want information on the Bartram Trail then there is a nine page section here, but you are better off with the Bartram Trail Guides or Long Trails Of The Southeast. Birdshooter’s Take: This is not a guidebook but a historical account of Bartram’s travels. My Recommendation: One of a number of good books on the travels of William Bartram. This guide is an invaluable resource for anyone interested in the life and accomplishments of William Bartram and the colonial history of the Southeast. It is intended as a companion for those who wish to make short excursions through the land visited and explored by William Bartram, to visit historical sites and areas of environmental significance. Birdshooter’s Take: This is not a guidebook but a historical account of Bartram’s travels. My Recommendation: Another good book (and more recent release) on the travels of William Bartram.